Not only was I not really feeling the stripes, but the skirt looked sloppy and was impossible to keep straight. 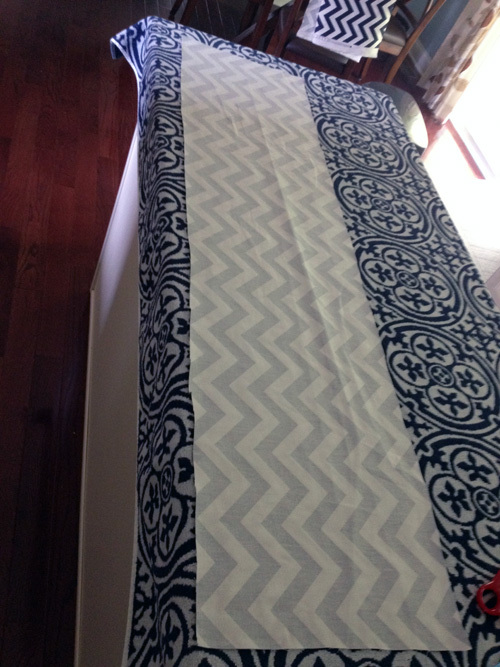 I remembered seeing a tutorial for a no sew crib skirt over at Young House Love, so I decided to make one. Easton was overdue and it was one of those completely random, on a whim projects. Thankfully it only took a couple of hours one afternoon. I pretty much made up my own rules with this one. 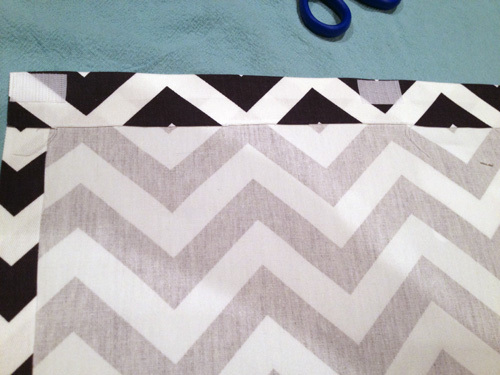 I decided to make 3 separate panels for the skirt– one on each side and one across the front. I figured since you’ll never see the back, there was no point in making that panel. 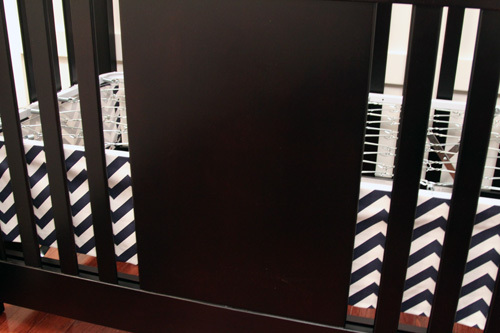 To keep things simple, I used the measurements from the crib skirt I already had and determined that I needed two 25″ x 10″ panels and one 51″ x 10″ panel. I added about two inches to those measurements and cut some panels. Then, like the curtains, I just ironed on some no sew hem tape for each edge. Once again, you can see my wonderful cutting skills. 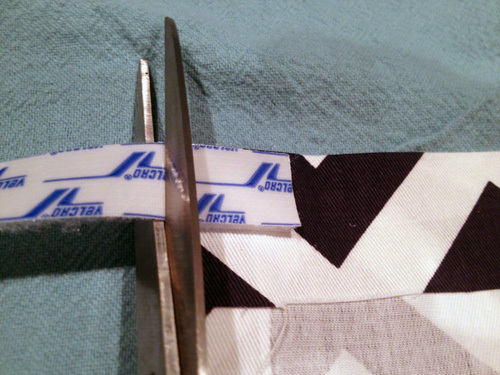 I cannot cut straight for the life of me, but as long as the hem fold is straight, it’s okay. 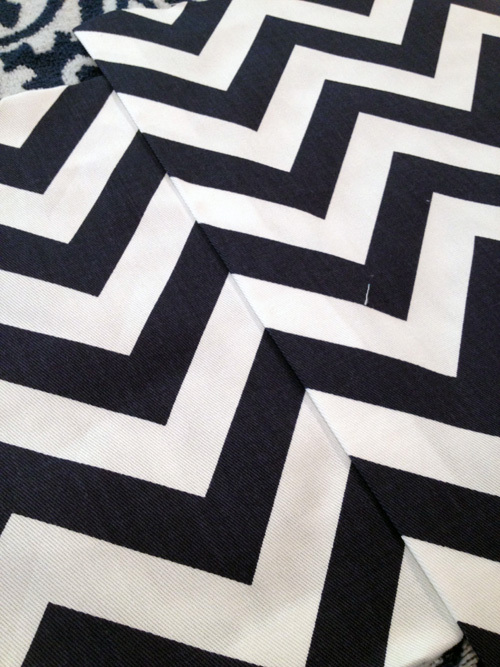 Once I hemmed all 4 sides, I was left with this. 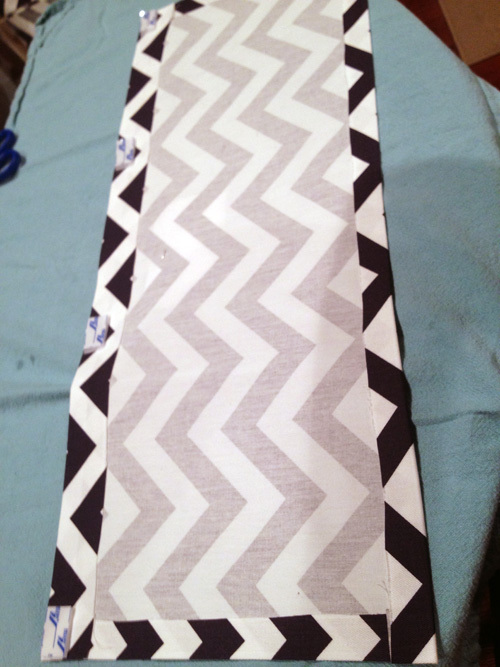 When I started the side panels, I made sure that my zig zags were going to line up. I just marked the top and the bottom with a disappearing marker and pinned them before ironing and hemming. I realized after the fact that this step was unnecessary. 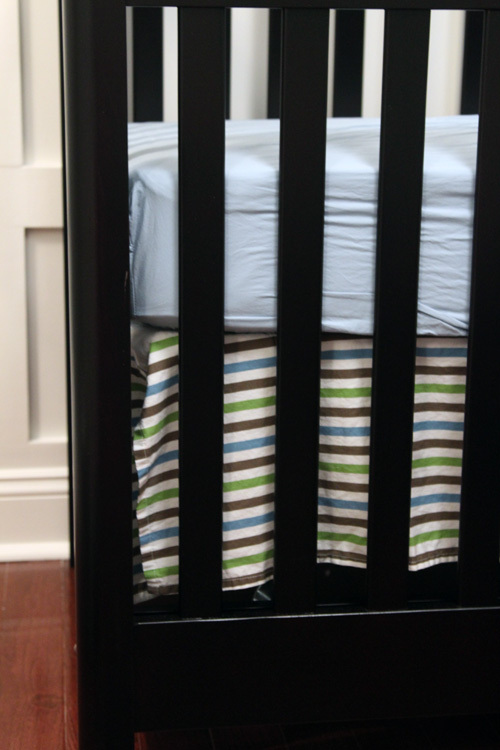 Because the crib has fairly thick, solid legs on each corner, you don’t see where the fabric meets. Plus I kept my 3 panels completely separate, so they never touch and are never seen. I now had 3 separate hemmed panels. I marked each one so that all of my hard work was not in vain (though it sort of was, see above line). Then I had to figure out how to get these on the crib. 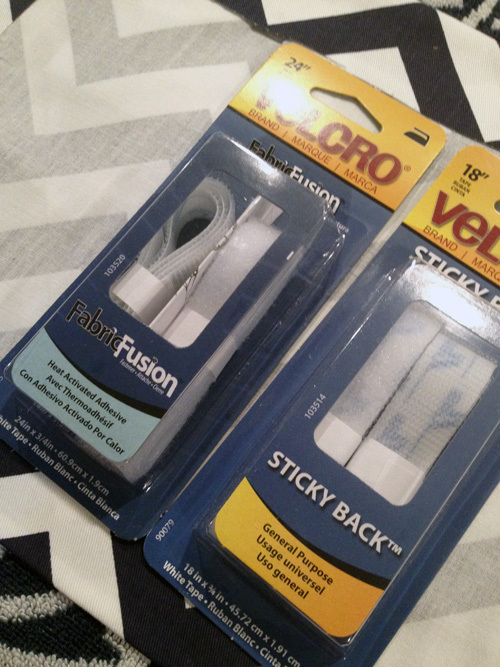 After browsing the velcro aisle at Michael’s, I came home with these two packs of velcro. I got one pack of Fabric Fusion velcro to adhere to the panels I just made. Then I got one pack of Sticky Back velcro to adhere to the actual bed frame. I cut small pieces of the Fabric Fusion velcro loop side and ironed it across the top of each panel, placing a piece every 8 inches or so. 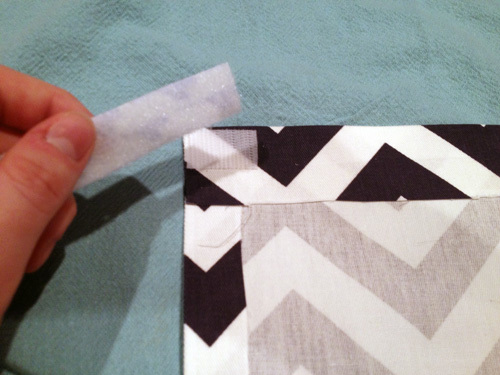 Then I cut the opposide side of velcro, the fuzzy side, from the Sticky Back velcro. To make sure it was the same size as the pieces I ironed on, I stuck the pieces together first then trimmed them. Then I had panels with velcro at the top that just needed to be adhered to the crib. I peeled the paper off of the Sticky Back side and stuck it onto the metal frame of the crib. The great thing about velcroed panels is that they are easy to remove to adjust or wash. There’s no need to remove an entire mattress just to fight with the skirt. 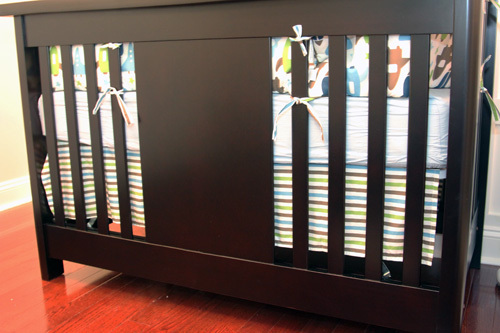 Once the crib was all made, I loved this new skirt so much more than the cookie cutter one that came with the bedding. Wow where are you a year ago when I had to sew one of these for my grandson! This is just brilliant. Great tutorial too. I am going to pin this for next time I am asked to make one of these. Thank you! 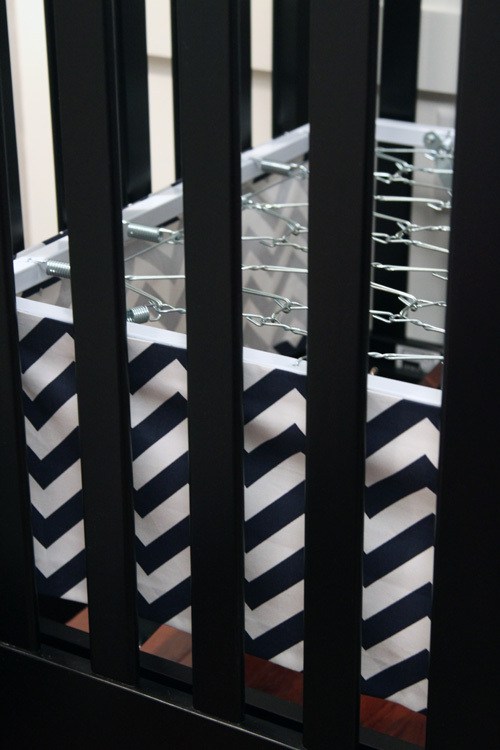 I agree with you – the chevron crib skirt looks so much better than the original you had. I love that it just subtly peeks through the bars! So cute! It definitely looks WAY better than the original! I found your website from the Pinterest challenge over at YHL, and got lost going through the archives. I saw this post and HAD to comment. 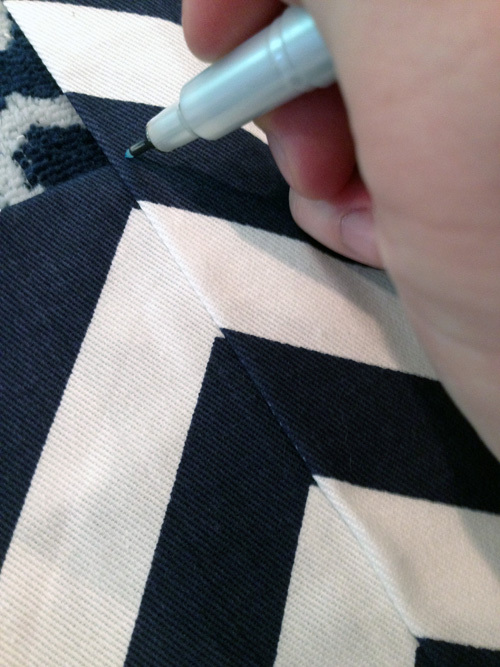 I have owned a professional soft-furnishings workroom for years and when I see these DIY “no sew” tutorials online I usually cringe….but this was HANDS DOWN the BEST “no sew” tutorial I have ever seen!! 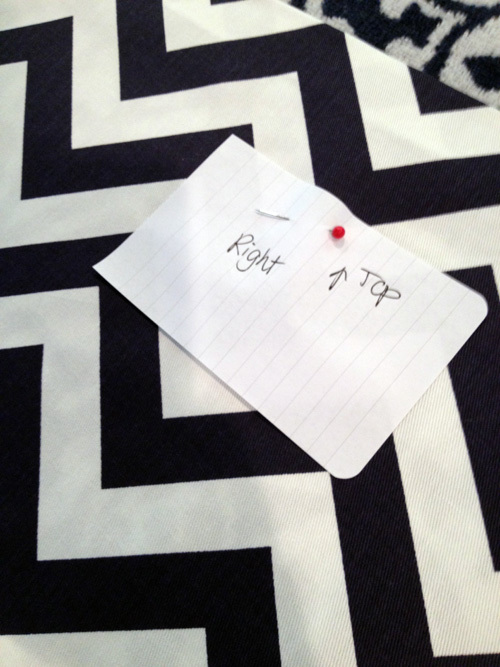 Thank you, for taking the time to show how to pattern match. A very important step in getting a professional looking finish. 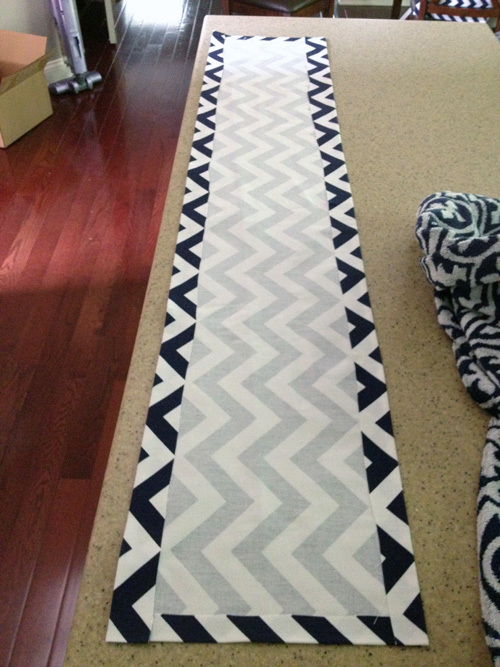 I will definitely be referring my friends to this site when they ask me to show them how to make a crib skirt. Bravo!! You are brilliant! I’ve been looking for a crib skirt for my son’s cowboy themed room and have found nothing! I decided to make one myself, but being sewing-impaired I thought that wouldn’t be an easy task! Thanks so much, I’m making one next weekend for sure! I LOVE this! 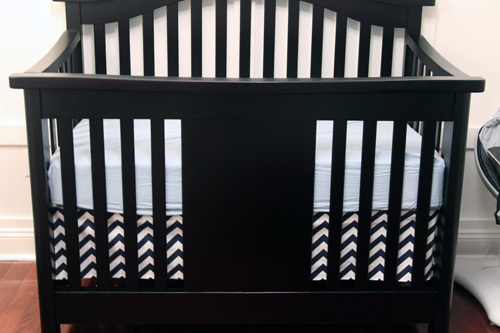 I stumbled across your blog today and got sucked in- and we are in the middle of painting/creating a nursery and I am stumped about the crib skirt! Thanks for this wonderful idea! How many yards did you buy? 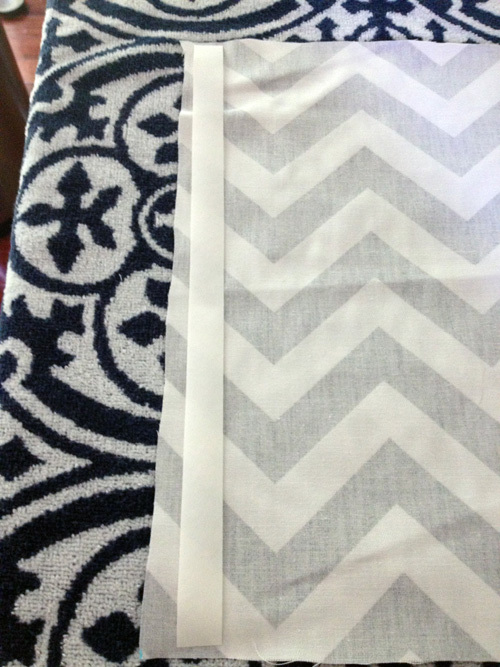 I also made curtains so I bought way more than I needed for the skirt! my son has the same name!!!!! 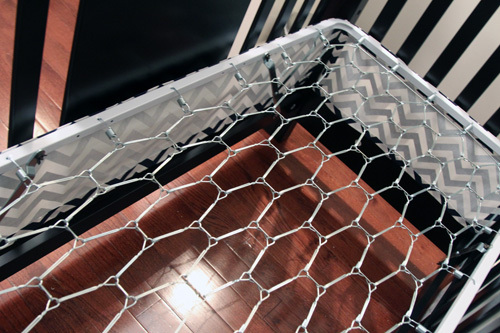 How many yards are necessary for the crib skirt? What would you say the total cost was for this project? And I second the yardage question! 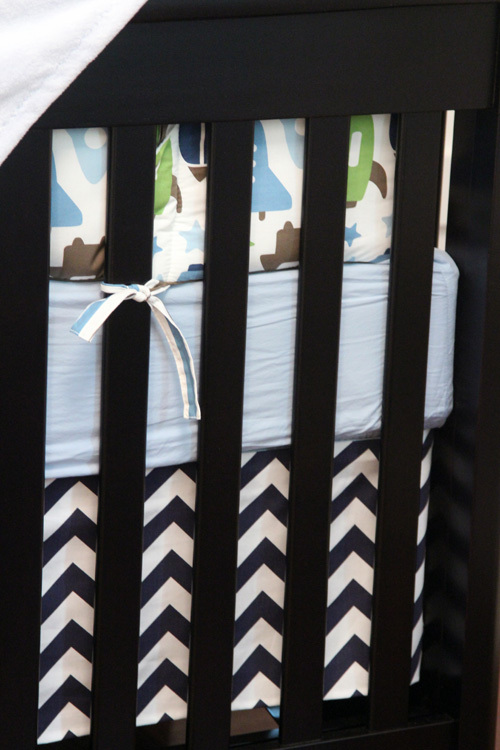 I am considering a Target bedding set I found on clearance for $35, but frankly the only piece I love is the chevron crib skirt. I’m trying to decide if I can beat that using your tutorial! 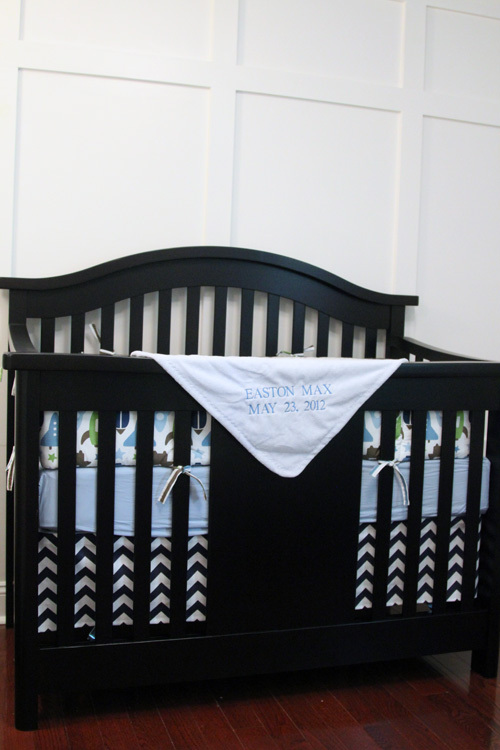 Do you by any chance still have that crib skirt and by any chance interested in selling it??? Hello! Brief query that’s totally away issue. Did you know how to make simple an internet site cell phone friendly? My web-site seems to be bizarre when exploring from my mobile phone. I’m looking for a concept or wordpress plugin that might be able to clear up this problem. If you have any suggestions, please share.